We bid farewell to the class of 2016 on the 23rd of April. The programme was very entertaining. We started with an opening song prepared bny the present tenners, following by songs sung by Mr. A. Sharma and Mr. Vivek Chettri. We had a game in which the passing out tenners, had to choose their partners and dance on a paper. They had to dance on the paper and when the music stopped they had to fold the paper into half. At last they had to dance on a small piece of paper and the dancing pair who could still balance themselves on the small sheet till the end was declared the winners. The boys even carried each other to win the game. We served lunch in the afternoon and then competition for Mr. and Mrs. Gyanoday started. This time the judges were – Mr. Sitesh Chettri, Mrs Karma Bhutia and Mr. Vivek Yonzone. Everyone walded the ramp and answered the questions asked by the judges. The most awaited moment for all! Miss Gyanoday 2017 title was given to Numa Phung Subba and Mr. Gyanoday title was given to Avinay Rai. 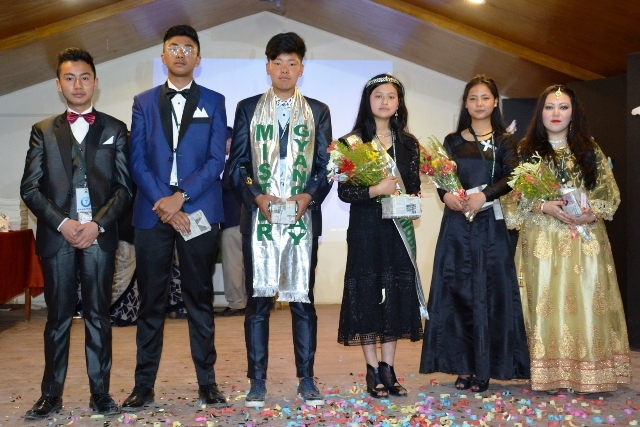 The first runners up were Dipashna Mukhia and Avinay Gurung and the second runner up were Sai Prasana Thapa and Sonur Thapa. Prizes were given out to the best dressed boy / girl and the best dancer boy / girl. Handed them souvenirs along with school khadas and school annuals with heavey hearts we finally bid them goodbye. Shakshi Thulung X Science.